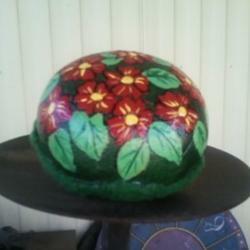 $6.00 Categorized under: flowers, river rock decorated. This lovely painted rock is about the size of the palm of your hand. It would make a nice paper weight on a desk or a accent decoration next to a potted plant. Marti will paint one for you (although it will be slightly different). It can be in any color of flowers.